08 Feb 2019 --- The first ever Europe-wide strategy on plastics was announced in January 2018, but one year on, what impact has this had on the European plastics value chain? 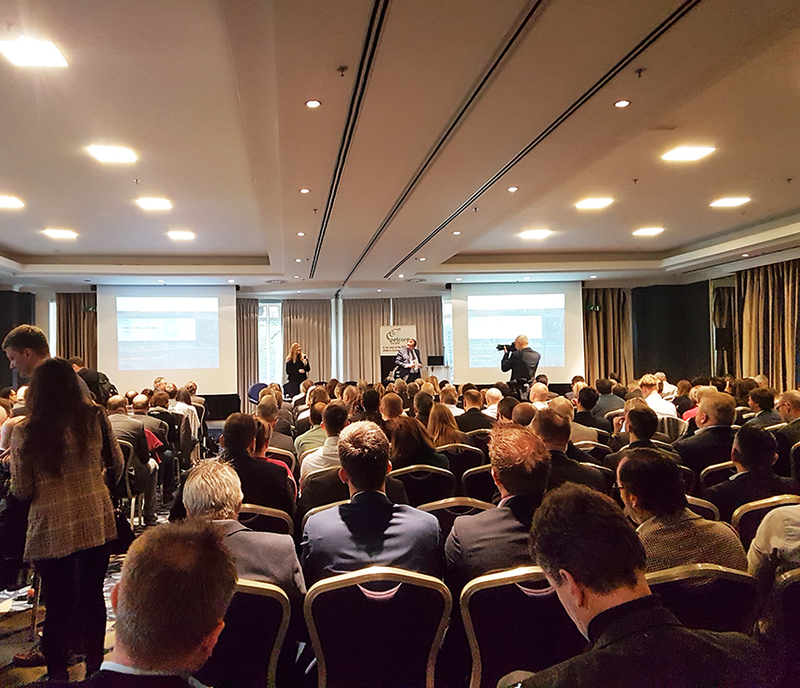 PackagingInsights reports from the Petcore Europe Conference 2019 in Brussels, where the “EU Plastics Strategy 2.0. Taking the PET industry to the next step,” discussion centered around what the future of PET will look like amid wide-reaching regulatory and societal change. Key themes at the conference, which included speakers from Procter & Gamble (P&G), Reloop, ICIS, Sukano, DG Grow and the European Commission (EC), were optimizing collection and sorting to increase recycling rates, regulations around safe chemical use in PET, designing for recyclability and improving access to recycling to boost consumer participation. What was evident during the day’s conference was that a lot has changed in the past 12 months for the PET industry and that an urgent set of changes are necessary to meet impending targets and to avoid environmental degradation. The EU Plastics Strategy, coupled with the Single Use Plastics Directive (SUPD), proposed by the EC, has added a tremendous amount of pressure on the plastics value chain, from chemical producers, to packaging manufacturers and FMCG companies. It was most recently updated last December to outline which particular plastic items will be banned. “The plastics industry is facing significant challenges. In the past 24 months, we’ve seen a significant change in terms of new legislation at the European level. Particularly the waste framework directive, the packaging directive and most recently, the SUDP, which is scheduled to be published in the late spring. What it has done is change the system conditions under which businesses operate, especially those that buy or sell packaging,” Clarissa Morawski, Managing Director at Reloop, tells PackagingInsights. Click to EnlargeThe Petcore Europe Conference 2019 in Brussels, “EU Plastics Strategy 2.0. Taking the PET industry to the next step,” attendees comprised prominent companies from across the PET value chain. The EU Plastics Strategy sought to lay out a European strategy for plastics and is a vast document that necessitates the engagement of members from across the value chain. According to EC estimates, only 5 percent of the value of plastic packaging material is retained in the economy; the rest is lost after a very short first-use. The annual bill accounts for between €70 and €105 billion (US$79 billion-US$121 billion). 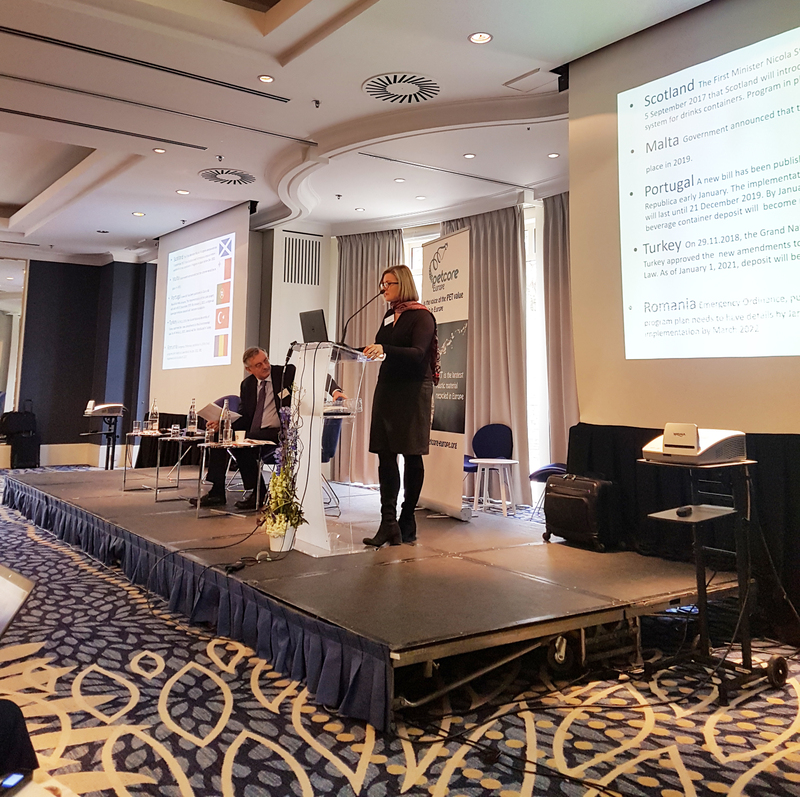 Five key system conditions underpinning the industry are driving change, as outlined by Morawski during her lecture: “Trends & solutions in PET post-consumer collection.” These conditions stem from targets in the EU Plastics Strategy and the SUDP. The industry is facing a large rising share of financial obligations, particularly in the form of greater EPR minimum requirements and litter clean-up costs. “If you’re a producer, you are going to have to pay a larger share. You may have to pay at least 50 or even 100 percent. On a per ton basis, these costs are also increasing. The ton is getting more voluminous as we have as an industry shifted to lighter weight materials. Although I would say this is environmentally good, it still means that the per ton costs are driven up,” says Morawski. The introduction of producers having to pay for litter cleanup, which has been suggested in the SUPD, could also lead to large costs. According to experts at the conference, this kind of collection can cost up to three times more than standard recycling collection by ton. The Plastics Strategy has set high targets for the recycled content that products must have within them. Although it differs by member states, as a rule of thumb, the goal is to reach 25 percent recycled plastic by 2025 and 30 percent by 2030. Companies are increasingly innovating on this front, yet this means that across the EU, brand owners are requiring high levels of feedstocks for their products, which are ideally of good quality. Within this legislative push, there are also an array of voluntary pledges. “We recycle for one main reason, to lower emissions. The emissions released by recycling secondary feedstock are significantly lower than virgin feedstock. Voluntary pledges are the single most effective way for companies to reduce their carbon emissions, as well as using the pledges to promote themselves,” explains Morawski. P&G has a goal to have 99 percent of all its hair care bottles sold in Europe converted to include 25 percent post-consumer recycled content by the end of 2018, while Unilever has pledged to increase its use of recycled plastic content in its packaging to at least 25 percent by 2025, compared to 2015. 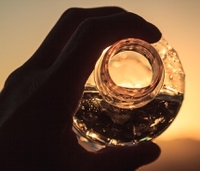 In the bid to source higher quality post-consumer resin some of the big players have made large investments, such as in sustainable plastic innovator Loop Industries. Both Coca-Cola and PepsiCo entered into multi-year agreements with the company, while thyssenkrupp’s Industrial Solutions division, Uhde Inventa-Fischer, signed a Global Alliance Agreement with the company. A third system condition is that the recycling targets for the industry have been upped. The target for plastic beverage bottles has been increased to 90 percent, including the bottle’s cap, and the target is 55 percent for other plastic packaging. The bottles that must reach 90 percent, as outlined in the SUPD, include bottles with a capacity up to 3 liters. Alongside the increased recycling targets will be far more stringent recycling calculations. These new methods will aim to net the contaminants in collections and advise new rules on Click to EnlargeClarissa Morawski, Managing Director at Reloop, speaking at the conference.reporting the weight of packaging waste generated. Due to producers having to pay for their own waste disposal and recycling, the risk of misreporting must be minimized. Morawski notes that blockchain could play a part here. This increased accuracy could lower the recycled content number by 25 percent in some cases, meaning that if these increased targets are to be achieved, changes must be made. The fifth challenge, and perhaps the most significant, according to Morawski, is an emotional system condition: the problem of marine plastic. “People are getting incredibly emotional about plastic and the environment, and business leaders must have this on their mind,” noted Laure Baillargeon of DG Grow at the conference. “If we don't change the way we produce and use plastics, there will be more plastics than fish in our oceans by 2050. We must stop plastics getting into our water, our food and even our bodies. The only long-term solution is to reduce plastic waste by recycling and reusing more. This is a challenge that citizens, industry and governments must tackle together. With the EU Plastics Strategy, we are also driving a new and more circular business model. We need to invest in innovative new technologies that keep our citizens and our environment safe while keeping our industry competitive,” says Frans Timmermans, First Vice-President at the EC. The immense emotional societal response to marine plastic, dubbed the “Blue Planet effect,” also played a large part in the formation of the SUPD. The NGO community released a list of the top ten plastic polluters in October, which went viral. Plastic beverage bottle companies Coca-Cola, PepsiCo and Nestlé were the most frequently identified companies in 239 cleanups and brand audits spanning 42 countries and six continents. Over 187,000 pieces of plastic trash were audited, identifying thousands of brands whose packaging relies on the single-use plastics that pollute oceans and waterways globally. In the minds of some of the experts present that the conference, the timing of the investigation was planned and contributed to the SUDP being as aggressive as it is. “If you think about these five new system conditions, the systems that maintain the status quo are not good enough. Now, there will be a real financial and compliance push for these companies to find better solutions,” says Morawski. Part two of this investigation into the future of PET, based on the Petcore Conference 2019, will consider some of the solutions presented at the conference. This will include P&G’s watermarking technology, Reloop’s studies into Deposit Return Systems and PLAREBEL’s (European Associations of Plastics Recycling & Recovery Organizations) implementation of recycling activities in Belgium.